I recently took place in a contest to win a diamond worth £5,000. I have no real love of diamonds, but do like money, so had I won I planned to sell the diamond and buy twenty pound notes, or if the pound keeps going the way it does, maybe some fifty euro notes. The nice thing about money is that you can exchange it for stuff, like beer, food and Dr. Scholl's odour eating insoles. 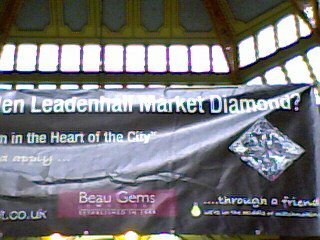 Anyway, the diamond hunt was put on by the Leadenhall Market, which is a market that dates back to the 14th century. 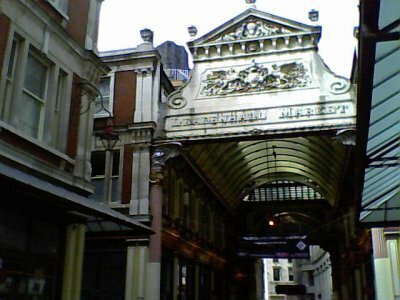 Today they still do the market thing Monday to Friday, but augment the income by holding events and being the host to a number of high end shops. The diamond hunt was a virtual one right up until the end when the actual diamond hunt went out into the streets. The winner found it at the Monument to the great fire in London. The virtual part of the hunt was set up as a crossword. Each day a London based clue was posted, and you had to decipher the clue to figure out what part of London they were talking about. Some of them I knew, but mostly I had to hunt around on the internet to find the answer. For example, I learned that every May there is a car treasure hunt called the The Miglia Quadrato that ends in Finsbury Circus. One of the clues also had me looking up from London Bridge to notice the clock topped with a golden owl on the corner of King William Street. I've probably walked by that building dozen of times without noticing the golden hooter perched atop the clock. In a lot of cases, after finding the virtual answer I went out to see the actual location. It was an interesting way to get to see places in London I might not have seen otherwise. Treasure hunts of a less virtual type of very popular here in London. I've already mentioned the Miglia Quadrato, which is a car treasure hunt. Some other examples include a number of discovery walks and Shoot Experience which offers photo-based treasure hunts. Londonist, a local blog, has a whole category for treasure hunts coming up. Even more cutting edge is geocaching, which uses GPS enabled mobile phones to search around a location. 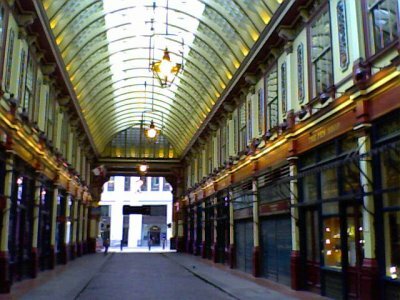 I must admit, until I did the Leadenhall Diamond hunt, I probably would have dismissed the treasure hunt idea as being a little childish and geeky. 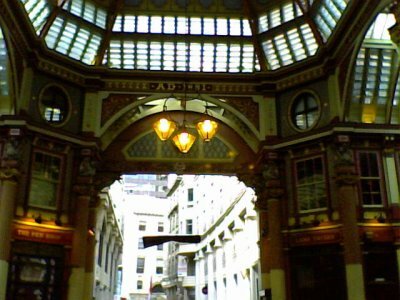 Now that I have done the Leadenhall Market diamond hunt, I'm starting to think that a flesh-and-blood treasure hunt would be both a good way to learn about a location, its history, get some good exercise and have a good time. I'm heading off to Cardiff in a few weekends. Maybe I should download a hunt to see the learn more about the Welsh town. Doctor Who and Torchwood is filmed there. Maybe they have a geeky, sci-fi themed one!